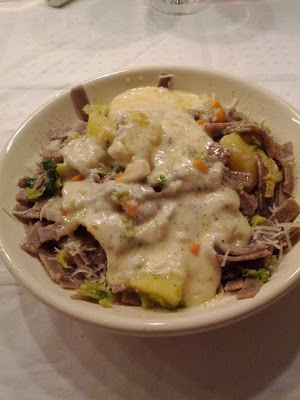 Via Twitter, Facebook and Google+ I received some requests for the recipe of Pizzoccheri. 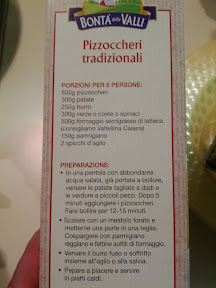 I have taken the recipe of the box of the pizzoccheri I usually buy in our local supermarket. Cook the potatoes and vegetables in boiling water, add the pizzoccheri after a couple of minutes and boil it for another 12-15mins until the pasta is nicely cooked "al dente". When the pasta (and potatoes and veggies) are cooked drain the water and mix the slices of cheese and grated Parmesan under the pasta and veggies. Meanwhile melt the butter on low fire with the garlic and sage (don't fry the garlic) and serve it over the pasta.